VJ Enterprises was founded by Vera Lopez and Joshua Shapiro in 1991. Vera has now left and works through her company Spirits of the Earth which continues to offer to spiritual seekers some of the best tours to Peru. For info about these tours see: (http://www.spiritsoftheearth.com) In 2009, Joshua met his current life partner Katrina Head in Atlanta, who is now assisting him to run our organization. Katrina Head: Katrina is a hands-on-healer who is guided and assisted by an inter-dimensional group consciousness that is called “The Melchizedek Guardians” (or Katrina calls them “The Guardians”). Katrina enters into an altered state of awareness and is guided by “The Guardians” through numerous levels of intelligence and inner wisdom which exists beyond polarization and from a unity level (i.e. – All is One). “The Guardians” were introduced to Katrina by various other galactic civilizations (the Arcturians and the Sirian Council) who were working with Katrina first, because their natural energies were more compatible with the human energy. Now as Katrina works with “The Guardians”, she is able to receive the base of 12 and 12th dimensional energies which represent the 12-Strand DNA body. Therefore when Katrina receives “The Guardian’s” healing energies and modalities, she is able to share these frequencies with her clients when she is doing her healing work. She shares over ten crystal skulls with Joshua Shapiro as part of their public work together. Joshua "Illinois" Shapiro has been an Aquarian Age Networker, author, and speaker since 1980. He is the author of the books, Journeys of an Aquarian Age Networker (1982); UFOs, Space Brothers & the Aquarian Age (1985); and co-author/publisher of Mysteries of the Crystal Skulls Revealed. Joshua has given many lectures throughout the U.S. and parts of South America on such topics as Crystal Skulls, UFOs, Peru, New Age Networking, and intuitive spiritual readings. 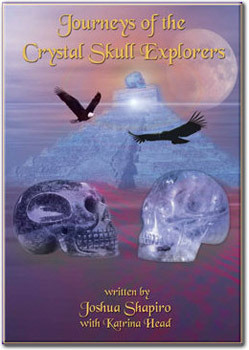 He is currently working on various projects dealing with Crystal Skulls, including his new book Journeys of a Crystal Skull Explorer, Crystal Skull research, setting up events to share information about the crystal skulls and conducting research around the Crystal Skulls ( for the World Mystery Research Center ). In addition, he is the creator of NA NET, a computerized New Age networking system that helps to link local resources and organizations/individuals, which he envisions as a key component to help build the Global Online Network. Part of the vision as NA NET has manifested on the V J Web Site as our two free network of Web Sites, NA NET Global (for New Age members) and UFO NET Global (for UFO members). In 1996, VJ gave a call out to the Internet World for some Web Helpers. The following individuals we recognize for their help with our web site during the 1995 - (early) 1997 time period. First we recognize Sentinel, for helping to co-sponsor our site for a time and also for his contributions in our UFO section. Siam added style changes to throughout our site and added some new pages in our New Age section. March (1996): Dave Vetterick took over our UFO section and is constantly scanning the airwaves for new leads on key UFO information. Yes Dave!!! Randy Krippner also helped us out at the end of 1996 with UFO related information especially connected with Haley Bopp. August (1996): We once again have heard from a few new people who have offered to help our site . . . Sean Bennetts of Melbourne, Australia, our first International Helper, gave Siam some help with the design style of the pages in our New Age Section. We also were greatly assisted by Don Bright, a graphics wizard who literally transformed the graphical interface of most of our site (you will see his contact imformation at the bottom of several pages). Special Recognition goes to Bob Garth for helping us to get the V J site going on his Protree Services and providing our Crystal Skull Mailing List -and- to Jeffrey Mishlove for providing mailing lists for our Global Web Site Networks -and- to Algonguian (former manager) and Geoffrey Keyte for helping with the management of the Crystal Skull Mailing List at times. Additionally we would like to acknowledge the following two gentlemen for supplying international UFO news and support for our site: Pedro Cunha -- UFO researcher in Brazil (for the Varginha material translated into English) and Javier Sierra, editor of Mas Alla magazine in Spain and UFO researcher/author. (1997) Adi Mindruta in Romania agrees to be our New Age Section leader ... Adi is helping slowly but surely to give this section a new face lift. Also in the later part of the year, Audre Dudeniene in Lithuania began to translate some of our pages on her own site into Lithuanian, especially including information about the Crystal Skulls. UFO Dave (Vetterick) has continued to do an outstanding job of maintaining now assumed the duties as the UFO/Roswell Section Web Master. Expect to see some changes in the organization of this section and the lastest UFO news as UFO Dave keeps us on our toes. Peter Blinn joined our team to help with some redesign of our UFO pages and assist Dave. Welcome to Peter. To learn how YOU can be a part of the VJ Enterprises family, visit our Web Helper Info page. Become involved in the rewarding experience of contributing to the wealth of knowledge that the Web provides us all. For a summary of the most recent What's New information and new pages that have been added to our website, please go to our section entitled What's New! This page provides a chronological listing of descriptions of and links to new material added to the site. We recommend that you consult the What's New section periodically as we never know when new stuff will go there! !